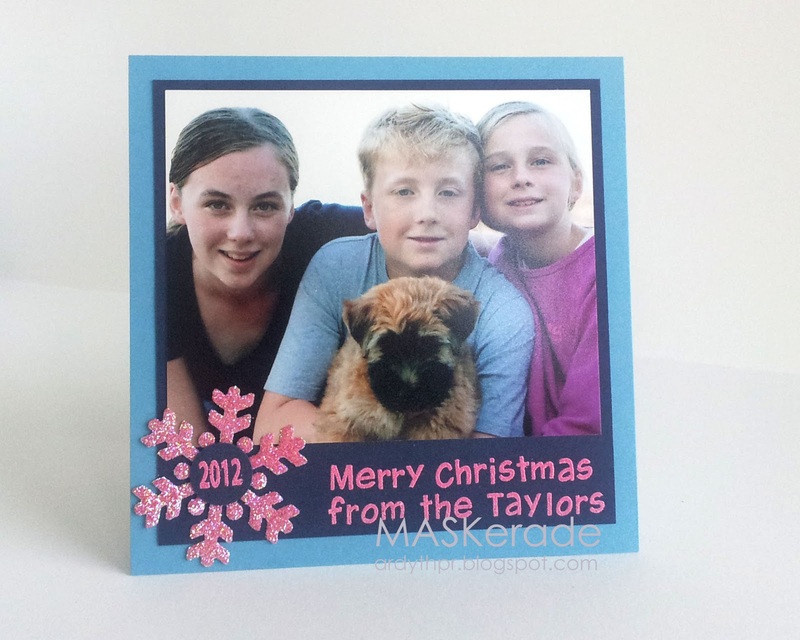 MASKerade: Inspired by Happy Dance! For the message, I used Melon Mambo embossing powder (rather successfully, I think (I was surprised at how well it showed up on the Night of Navy!)) and then I coated the snowflakes in glitter by putting a strip of 2" sticky strip on to melon mambo before cutting the snowflakes with my Cuttle Bug. Then I just peeled off the liner and popped them into the glitter. I used Lawn Fawn's Harold's ABC's - so easy because it's a fun font and straightness is not required! I embossed "from the Taylors" 80 times and then "Merry Christmas" 80 times. Another reason to love that alphabet is that it has 3 r's - someone was clearly thinking about how an alphabet would be used in real life situations! 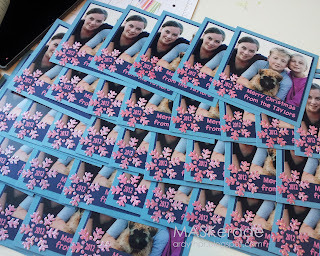 Now I have 32 photo cards to make for another friend, and about 100 non-Christmas thank you cards for on of the teachers at my daughter's school to give to the breakfast club volunteers. Another busy weekend ahead! Amazing, amazing cards for your friend! And I love the cool wreath card. With all of those cards to make, I don't know how you ever get out of your craft room. You did a great job. I'm sure your clients are happy dancing, too. Your friends must be absolutely THRILLED with the end result! The Melon Mambo embossing is so striking on the Night of Navy cardstock! I cannot imagine having to make all these cards...you're a good person for doing so Ardyth! Those are some serious numbers you've been churning out! 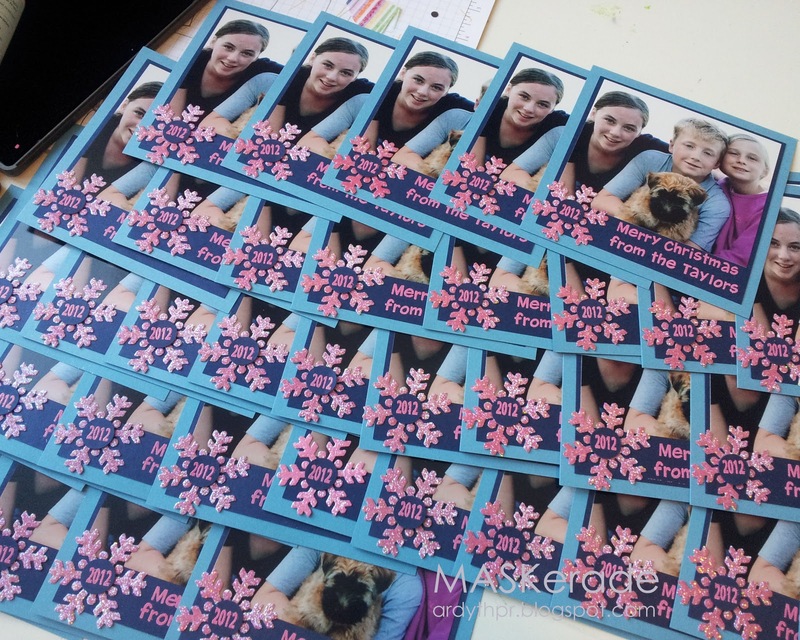 You are a card making machine!! It never ceases to amaze me what creations you can come up with using basic shapes! That must be the CAS-est wreath I've ever seen! Oh these are the cards you were busy making ... love the nontraditional colors! What a crazy schedule you have!